The key to a successful digital innovation is in profound scientific research, conducted within a multi-disciplinary group of professionals. The imec.icon research program is our success formula for demand-driven, cooperative research. Our second call of 2018 will open shortly, with deadline October 3. Do you have an innovative idea in ICT, our health and care sector, the manufacturing industry or other domains? 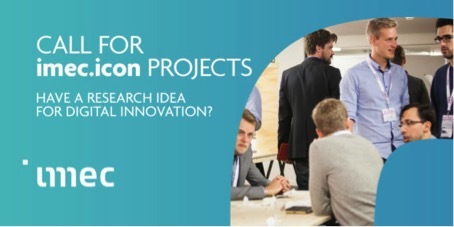 Discover how our imec.icon research program can help you kick-start your project. The networking drink afterwards is the perfect opportunity for you to meet and exchange with potential project partners!